Ok, so you have your Shopventory account, it's all synced up, and you can see your sales history and inventory. Now what? For a full guided video tour, click here. We're going to take a wild guess you don't refer to your business as "Location 1." To fix that, just pop over to your Locations & Integrations page, and if it says "Location 1" in blue, click on it. Then you can name it something reasonable, like "Main Street." While you're at it, you can put in a phone number and address too! This will make it easy to fill out purchase orders later on. Note: The time zone that's set in the Locations & Integrations tab is what will be used to generate your reports, so make sure the time zone is accurate. Read more on setting up your locations here! If you have more than one location for your business, add them now! After you create an additional location and fill in the basic info, you can add an integration (e.g. a Square or Clover account) to track your sales. Now Shopventory can help you manage your inventory all across the board. If you have a warehouse or storage space for which you'd like to track inventory, you can do that by simply not adding an integration to a location. Shopventory will keep notes on which Products are where, but they can only be sold from locations with connected POS accounts. Learn more about warehouses here. This is one area where Shopventory can really give you a hand. If you're tired of finding out too late that an Product is out of stock, let's get you ahead of the game! The first thing you'll have to decide is what qualifies as "low inventory." This will be different for various products and categories. If a product is fast-moving or you need a lot of lead time to order a new shipment, "Low" might mean a higher quantity. If you only have a few of an Product to begin with, or it tends to sell only occasionally, you might not want to be notified until inventory hits 2, 1, or even 0. When you've decided how you want to be notified of low inventory, methodically go through your inventory and create your alerts accordingly. Read the how-to here! 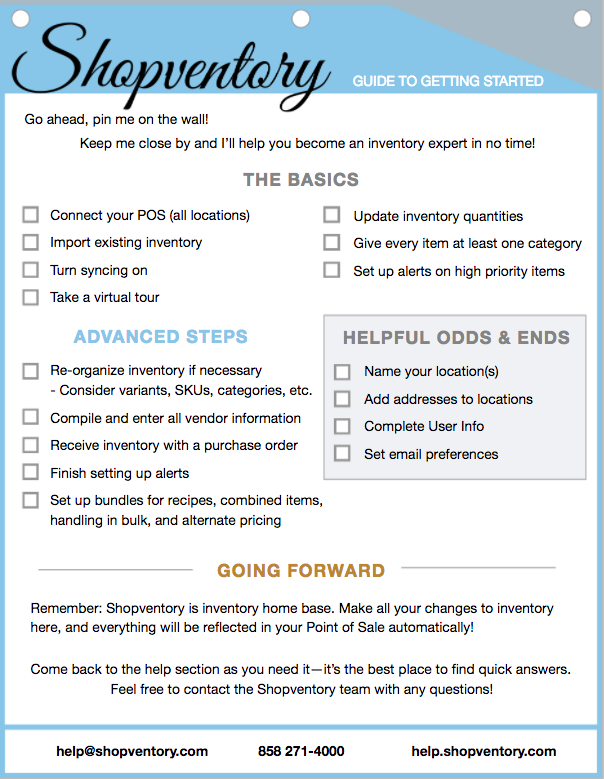 If you're an old pro at tracking inventory and your POS accounts are up to date, you're good to go! Shopventory has the latest. In case you don't really know what's on the shelf, have no fear! We have the tools for that. Download our reconciliation worksheet, get out there and get some numbers, and start fresh. After you have your numbers, you can update your quantities all at the same time (see how). Inventory freedom, here you come! Are you selling something that's not in your POS? It's easy to create new Products in Shopventory. If you want your inventory to be as accurate as possible, make it a priority to get those new Products in Shopventory this week! It's time to eliminate the sticky note pile. First, head to the Vendors tab and start creating entries for each company that sells to you. You'll want to put in as much information as possible, including which location(s) they sell to and all the contact info you can find. Feel free to leave yourself reminders in the Notes section about who it is you generally deal with, when is a good time to call or order, etc. Once your vendors have accounts created for them, the next step is to connect them to the products they sell. To do that, just click on the vendor's name in the list and tap the "Edit Variants" button at the bottom. Find their products on the left, click the little plus sign to assign them over, hit Done, and Save. That's it! See more of the details here! Now that your inventory is sharp, you have all your vendors in a row, and you have Alerts to remind you when Products are getting low, ordering more products is a cinch. Keep your purchase orders uniform and maintain a clean permanent record on your Purchase Order tab. When it's time to put in an order, just hit Create PO and fill it in. You've already done most of the work, so it's just a matter of specifying what you want. Get the full guide to purchase orders here. If you've made it this far, you're in great shape to manage your businessmore effectively and with less effort than ever before. Stick with it, and we have no doubt you'll see the returns on your investment continue to grow. Shopventory is inventory home base. Make your changes here, and everything will be reflected in your Point of Sale automatically. Come back to the help section as you need it. It’s the best place to find quick answers! The Shopventory team hosts a LIVE webinar called Shopventory 101 and is recommended for everyone. Simply click here to learn more about Shopventory 101.